A freestanding cast-iron spear occupies the centre of the gallery. 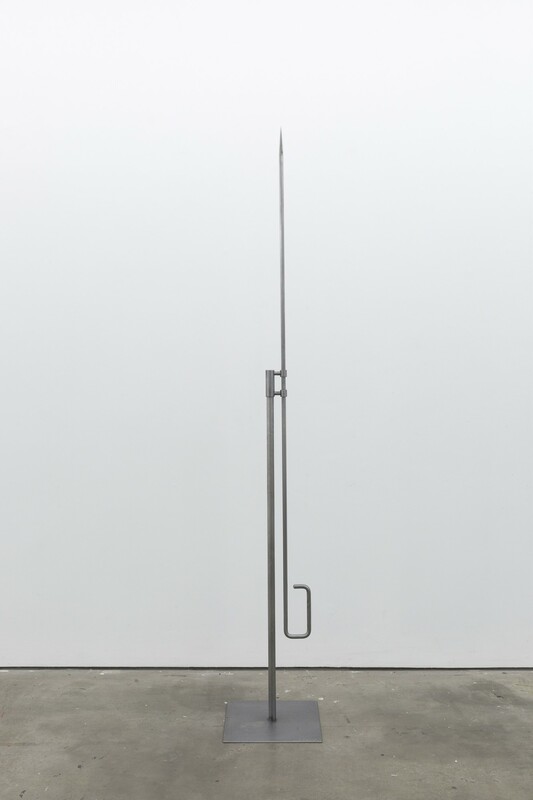 Nikita Kadan’s freestanding spear is part of a sculptural series based on weapons adapted from agricultural tools, used by peasants in the uprisings of the 1905 Russian Revolution. Kadan’s designs are drawn from specific artefacts from Gorlovka, a scene of a famous armed confrontation. In 2014, Gorlovka became a site of civic unrest once more when it was violently seized by pro-Russian separatists. It was only fully recaptured by the Ukrainian army in 2017. The work’s title, Tiger’s Leap, invokes Walter Benjamin’s rejection of time as a sequential narrative – instead, Benjamin suggests that the past may be instantaneously cited like a “tiger’s leap” as it “flashes up in a moment of danger”. Kadan’s sculpture suggests the possibility of a past revolution creating a revolution in the present.